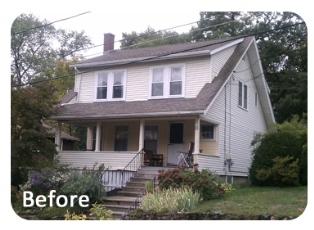 We removed the existing two layers of siding. Installed new blown-in insulation and then wrapped the house in a Moisture Barrier. We installed new Everlast Composite Siding in the Seaside Gray color. We installed new trim around the windows and doors, new fascia, rake boards and soffits. We also installed new windows in this home.